Braces are the traditional and most common route to straight teeth and healthy bites. If you are receiving braces at our practice, Dr. Anthony and Dr. Cook will place brackets and wires on your teeth to gradually move them into the proper position while working to adjust your bite. 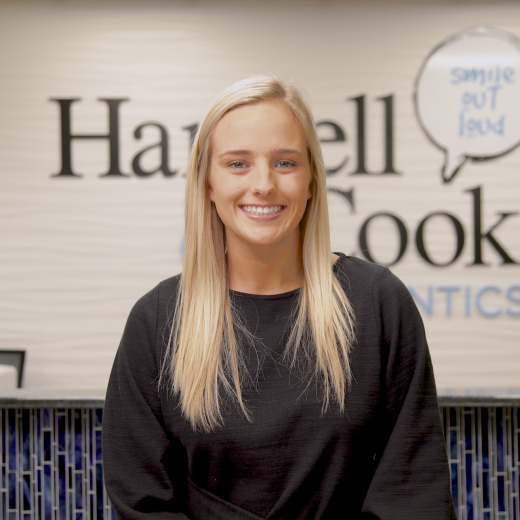 The best way to learn if braces are the best option for your treatment is to visit us for your complimentary consultation appointment—but you can learn more about what it’s like to receive braces at Harwell & Cook Orthodontics by watching the videos below from our patients. The team at Harwell & Cook Orthodontics is committed to offering the latest advancements in orthodontics to all of our patients, no matter their age. There are so many options these days beyond traditional metal braces. Whether you choose invisible braces or removable aligners such as Invisalign® and Invisalign Teen®, braces with bold, fun colors, or any combination of options, your treatment at our practice will be custom-tailored to you. When you visit any of our five practice locations in the Texas and Oklahoma Panhandles for your initial consultation appointment, your orthodontist will review your options and help you select the solution that is perfect for achieving your best smile for years to come. You can learn more about braces at Harwell & Cook Orthodontics by checking out our Braces FAQ. For even more great information about receiving treatment with braces at our practice, we encourage you to explore our Patient Stories section where you can watch videos from some of our happy orthodontic patients. Traditional metal braces. While metal braces with brackets and archwires are the most common type of braces and the most popular for kids and teens, they don’t have to be run-of-the-mill—you can choose colorful elastics to liven things up! Go ahead and mix and match the colors of your elastics at every appointment if you like. Get creative with it! Clear, ceramic braces. For a more invisible look, ceramic braces may be a great option for you. These braces are made of clear monocrystalline/ceramic materials. Due to the size and fragility of the brackets compared to metal braces, ceramic braces require extra attention and are not recommended for our younger patients. Also, because of the extra care required, ceramic braces are typically placed on just the upper front teeth while traditional metal braces will be placed on most of the lower front teeth. Clear, removable aligners. Invisalign and Invisalign Teen are a popular and effective choice to straighten teeth while avoiding the look of metal braces. Computer imaging technology is used to create a series of custom aligners that give you the smile you’ve always wanted gently and efficiently in a series of small steps. Clear aligners are virtually invisible and completely removable—patients can remove the aligners to eat, drink, brush, and floss normally. Dr. Anthony and Dr. Cook are the top providers in the Texas and Oklahoma Panhandles for this innovative treatment option! Harwell & Cook Orthodontics offers the type of braces that will suit you and your smile best—no matter your age, and within a budget that makes sense. We love working with kids as well as adults—and because you’re like family to us, we will treat you with the care and consideration you expect and deserve in a comfortable and welcoming setting. We encourage you to contact our practice to schedule your complimentary consultation. At your consultation, Drs. 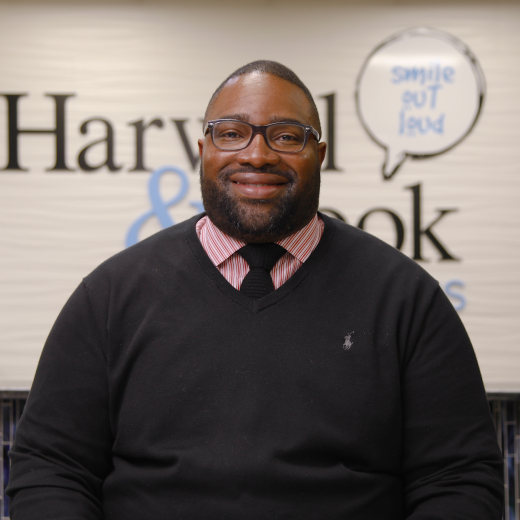 Harwell and Cook will work closely with you or your child to create a personalized treatment plan for braces that addresses your/your child’s specific condition and needs. We look forward to meeting you! To learn more, check out our Braces FAQ. For over 40 years, the team at Harwell & Cook Orthodontics have provided quality orthodontic care with a smile for patients in the Panhandle area. We offer each one of our patients the most advanced technology available today for comfortable, fast, accurate orthodontic care with incredible results. With multiple treatment options available including traditional metal braces, Invisalign, and clear braces, you can trust that we will get you smiling out loud with the healthy and straight smile you have always wanted! There is a general misconception that all braces and orthodontic treatments are the same. With all the options available today it is more important than ever for parents and patients to carefully select what type of braces and technology will be used. The Damon System not only produces beautiful smiles and straight teeth, but also carefully considers how the face is going to change and mature minimizing the aging process. Most people believe patients have such crooked teeth because their jaws are simply too small. Faced with this crowding, traditional approaches often call for permanent teeth to be removed, followed by braces, wires, and strong pressure to move the remaining teeth into a very narrow arch form. Even though teeth may be nicely aligned, long-term research often shows a negative impact on the aging face, bone, and tissue. Traditional braces often apply heavy forces that can overpower the very delicate underlying blood vessels cutting off oxygen and nutrients. This can be more painful and actually slow down tooth movement and lengthen the time of treatment. The Damon System, however, takes a completely different approach. Recent studies show that crooked teeth are usually not caused by jaws that are too small but rather by the tongue and muscles in the face that are simply out of balance. With the Damon System, your orthodontist can use very gentle pressure working with the natural forces of your body. This allows your dental arches to develop the way they are always meant to. It is very exciting to see patients’ interior crowding eliminated with a wider, more natural arch form, and in most cases, this is accomplished in far less time with fewer visits and far greater comfort. What makes the Damon System so unique is that it not only straightens teeth, but on most adults, it can also have a major impact on the appearance of the entire face, slowing the aging process. For adults with narrow arches, even those with straight teeth, the Damon System can reverse the effect of the aging process by supporting the area of the mid-face, creating a more youthful appearance. What emerges is a more natural-looking appearance with a wider, brighter smile, rarely requiring surgery or tooth extractions. So how does the Damon System create this magic of the mid-face? By taking advantage of the very latest advancements in high technology. The space-age wires used in the Damon System are unique in that they continually work to return to their original form: an ideal, balanced arch. In place of traditional braces that hold the wire tightly against the teeth, the Damon System uses specially designed brackets that allow these wires to slide and move freely. Orthodontists can now apply less pressure—in fact, several hundred times less pressure on each tooth. This allows the body’s own healing and adaptive ability to create more space and a more natural arch form for the crowded teeth. The latest research using the most advanced imaging technology clearly demonstrates the benefits of moving teeth with forces that work in harmony with the body. Using biological sensitive forces, the teeth and surrounding bone can move together, creating a more natural smile and face. With most traditional orthodontic treatments, this patient would have undergone extraction, resulting in a narrower smile and flattened mid-face. With the Damon System, look at how the smile and face actually improve as the patient grows and matures. Patients can be treated with the highest level of care in a shorter amount of time with far greater comfort. With the Damon System, the future has indeed arrived. The braces experience is different for each patient: some have little to no discomfort, while others may have a little bit of soreness when they first get their braces on or after adjustments. This page includes some of the things you can do to minimize your time in treatment and maximize your comfort while keeping your mouth healthy and clean so that your appliances stay in top shape while they move your teeth. During your adjustment appointments, our team will check in with you to make sure that your treatment plan is on track. This is also a good time to ask us any questions you may have about your care. Our orthodontists and team love to answer your questions, so if you have a question for us and do not have an appointment scheduled, please give us a call at any of our five convenient locations. We are always happy to help and can even guide you over the phone if you are having trouble with your appliances. The truth is, you can eat almost anything when you have braces, as long as you avoid the foods that can cause you to lose a bracket, break a wire, or get tangled up in goo. Here’s a handy guide that can help you avoid any issues. Feel free to print this list out and put it up on the fridge. Common sense advice: Any food item that seems likely to stick to or damage your braces or appliances should stay on the shelf. Some patients can experience soreness or discomfort when they first get their braces or when they are switching aligners, but this doesn’t last more than a couple of days. One great way to relieve oral discomfort is to swish with salt water. Dissolve one teaspoon of salt in a cup of warm water and swish and gargle with it for a couple of minutes, being careful not to swallow the saltwater solution. An over-the-counter pain medication, such as Advil® or Tylenol® can also help. It may take some time to get used to how your mouth feels with your new braces or appliances, but after about a week or two, you will have adapted to the changes. We will provide a special wax that can be applied to the surface of your braces if you experience irritation on your lips, cheeks, and tongue while you are adjusting. Note: Loose teeth during your treatment is normal, so don’t worry if you notice some looseness. This is a good sign that everything is moving as it should, and any loose teeth will tighten back up once your treatment is complete. If one of your wires or bands should become loose or break, please give us a call so that we can work with you to fix the problem. If you are unable to see us right away, and you’re feeling confident about trying it, you can use the back of a spoon or a pencil eraser to move a loose or poking wire back into position. If you have pain or irritation because of a broken wire, you can place some of the special wax we provide, or a cotton ball soaked in water, over the part of the braces or appliance causing the irritation. Be sure to bring any piece(s) of your appliance that may have broken or fallen off along with you when you come in to see us, so we can make repairs. When you take great care of your appliances during your treatment, your time in braces will run smoothly, and your new smile will show your efforts! Dr. Anthony and Dr. Cook and their team will show you how to take care of your appliances when you receive them, but the general approach is simple: consistently wear your rubber bands, retainer, and other appliances, and be sure to avoid the foods on the NO list! When you’re on the playing field, whether you have braces or not, it’s important to wear a mouthguard. This device will help protect your mouth and appliances from damage. If you have a sports accident, check your mouth and appliance for signs of damage, and then contact us as soon as possible if you notice anything that doesn’t seem right. You can use wax on the damaged parts of your appliances to keep any irritation in check until you are able to come in to the practice. For more serious accidents to the head and mouth area, go to the nearest emergency room for care. Just like you, we’re happy when your orthodontic treatment goes smoothly and quickly. We all want the same thing: to get the best results as quickly and as comfortably as possible so you can enjoy your new smile. By practicing good oral hygiene habits during your orthodontic treatment, your treatment will be efficient, and your results will shine—so keep up that brushing and flossing routine! You can check out our Braces FAQ for more information about braces. At our practice, high-quality orthodontic care is affordable. Our patients have the opportunity to start full treatment with as little as $250 down and payments as low as $150 per month. We will customize a financial plan that works for every family, providing individualized financing options for everyone. We use a slider method that allows our patients to choose a down payment and monthly payment that best fits their budget, and orthodontic insurance claims will be submitted on your behalf by our office. Since every patient is different and, therefore, every orthodontic treatment is personalized, an estimate of the full cost for you or your child’s treatment will be a result of your consultation appointment at our practice. During this appointment, you will receive a customized treatment plan as well as an estimate of your cost. When you come in for your consultation appointment, we will discuss all your options in detail with you. Your personal preference, as well as the position of your teeth and other factors, will be carefully considered to determine the best course of treatment for you—and once your treatment plan has been created, we will go over the costs, including insurance and options for payment. Our page on payment options and insurance offers even more information on this subject. If you’re still on the fence about getting started on you or your child’s orthodontic treatment, check out some of the personal stories our satisfied patients have shared about their braces experience at our practice. 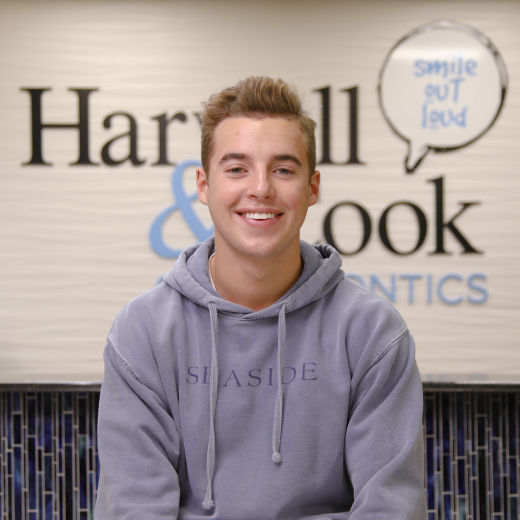 Your Harwell & Cook Orthodontics team is happy to answer any questions you have when we see you for your appointment—we love questions, so ask away! In the meantime, check out our FAQ below to learn some things you may not already know. Am I the right age to get braces? Everyone’s mouth has an ideal window of time when braces work best, but we won’t be able to know when your best time for braces is until we meet you and look at your teeth. The American Association of Orthodontists and Harwell & Cook Orthodontics recommends that kids see an orthodontist by age 7 to see if braces are needed right away or if it can wait a few years. Sometimes, even if you still don’t have all of your adult teeth, we may decide that an early start with braces is right for you, or we may decide to watch your growth and development for a while before it’s time for your braces. If we do decide to get started early on your treatment, you’ve lucked out! You might get to be the first one in your class to get braces! If you are between the ages of 11 and 15, you probably expect to get braces since so many of your friends have them. By age 12, most, if not all, of the permanent teeth are in place, and crooked teeth, gaps, and bad bites are highly visible. Starting treatment at this time helps us take advantage of your remaining growth to make orthodontic corrections during these important, formative years. If you stop by any of our offices after 3:00 PM on a school day, it almost feels like an after-school program with kids hanging out with their friends! Can I still play sports with braces? Can I play an instrument? The answer is a big YES! Braces or appliances will not keep you from joining in any of your favorite activities, including sports or playing an instrument. Of course, if you play a contact sport, you should wear a mouthguard to protect your teeth, whether you have braces or not. We provide mouth guards for braces patients from our offices at no cost. When you get your braces, our team will go over all the instructions with you and your parents, including information about what you can and cannot eat. There is one main rule to remember: if you think a food seems like it might get stuck in your braces or damage them, you’re probably right! Some of the foods on the DO NOT EAT list include ice, hard candy, nuts, raw vegetables, apples, and all the super sticky foods like caramel, gum, and taffy. If you follow the DO NOT EAT list, we bet you won’t have to come in for any emergency appointments to fix damaged braces. My new permanent teeth are crooked—won’t they straighten out on their own as they grow in? No. Since your permanent teeth are bigger than your baby teeth, the space available for your permanent teeth is limited. So, if your teeth are growing in crooked, what usually happens is that they get more crowded and crooked as they all grow in over time. But wait! There’s good news! Even if your teeth are very crooked, we can fix them, and once your braces come off, your new, straight smile is going to be amazing! When you come in and see us for your first appointment, your orthodontist will look at your teeth and tell you what he thinks is right for you and how long he thinks you’ll be in braces. The exact amount of time is different for every patient, but most kids have braces for a little under two years—but if you follow all the instructions that we give you when you receive your braces, you can shorten the amount of time you have braces! How often will I need to come in for appointments while I have braces? Your orthodontist will usually see you every six to eight weeks to check in and make adjustments. If we need to see you more often, we promise not to ask you to miss too many activities or too much school. Sometimes when you first get your braces, or after you have them adjusted at our office, your mouth can feel a little sore—but this usually only lasts a day or two. The rest of the time you will probably forget you even have braces! If you’re experiencing discomfort, go ahead and ask your parents for Advil or Tylenol or ask them to help you swish with some warm salt water. Gargling with salt water really can help! How does brushing my teeth work when I have braces? You can and should brush and floss when you have braces. Your Harwell & Cook Orthodontics team will show you the best way to brush and floss once your braces are on, and we will even give you toothbrushes, flossing aids, toothpaste, and mouth rinses! It’s a good idea to brush at least three to four times each day—once after each meal and again before going to bed. Your teeth and braces also appreciate a daily floss to get into those places between your braces where your toothbrush can’t reach. Can I go to school the day I receive my braces? Absolutely! The day you get your braces, you will be able to get right back to school—your friends will want to hear all about your experience! Can I get invisible braces or Invisalign? Yes! Clear braces, which are also called ceramic braces, are popular with teens because they are made of clear materials and are almost invisible, and Invisalign is a type of clear aligner you place over your teeth that is removable. We often recommend Invisalign for teens and younger patients—there is a program called Invisalign First that can treat kids as early as 7 for some issues. Drs. Harwell and Cook let you and your parents know if either of these orthodontic treatments is right for you. Would you like to hear stories from other kids like you about braces? Check out our Patient Stories! We like to keep our patients well informed, so we hope that the information on this website will help educate you about the treatments we offer and the conditions we treat at our practice. 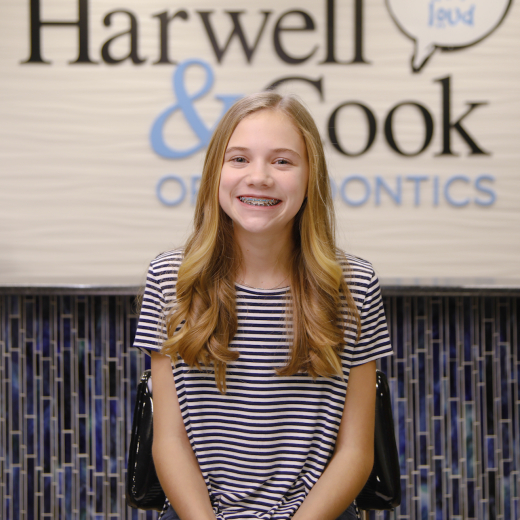 The team at Harwell & Cook Orthodontics is available to answer any questions you may have regarding your or your child’s orthodontic treatment. Contact us at your convenience at any of our five practice locations in the Panhandle area. In the meantime, we love sharing our frequently asked questions, so here’s a set just for the adults. The American Association of Orthodontists recommends an orthodontic screening for children at age 7, so the development of the permanent teeth can be tracked. Treatment may not start at this age, but the earlier your child is evaluated by an orthodontist, the sooner your child’s overall orthodontic condition can be evaluated and a plan for early intervention can be formulated if needed. We will see your child once or twice a year to monitor their growth and assess their needs, and since these appointments are so important, we offer these growth and guidance appointments free of charge. To learn more about how this works, check out our page on early orthodontic treatment. Phase one treatment is another name for early orthodontic treatment for children. This type of treatment typically begins between the ages of 7 and 10 and can last from 12 to 21 months. It’s called phase one treatment because it is usually followed by a second phase of orthodontic treatment that begins when the child is a bit older. Phase one is initiated when we detect significant orthodontic problems during a child’s first exam so that we can correct them and prevent more severe orthodontic problems for your child in the future. After phase one and a subsequent period of rest where there is no treatment, additional treatment with braces may be recommended for your child—phase two. The team at Harwell & Cook Orthodontics will keep you completely informed along the way so that you know what to expect and when. Take a look at our page on Early Orthodontic Treatment for more information. Can my child still play sports or an instrument with braces? Of course! Braces or appliances will not keep your child from joining in any of his or her favorite activities, including sports or playing an instrument. If your child plays a contact sport, we recommend a mouthguard to protect the braces and teeth during play. We provide mouthguards for braces patients from our offices at no cost. At our practice, we focus on making appointments as comfortable as possible, so most of our patients feel great and can go right back to class the day they receive their braces. If your child feels any soreness while adjusting to new braces, this should last just a day or two and can be easily controlled with over-the-counter medication such as Advil or Tylenol. For real stories from our braces patients, check out the videos on the Patient Stories page. At Harwell & Cook Orthodontics, we offer braces, aligners, and other options for every age group. Advanced treatment options that provide maximum dental and cosmetic benefit, such as Invisalign and ceramic braces, are very popular with our adult patients, but whether you choose metal or clear braces, hidden braces or Invisalign, our approach to your care will be completely personalized to you. With digital orthodontic treatment planning combined with our decades of experience, you are sure to have an orthodontic experience that exceeds your expectations at any of our five trusted practice locations in the Panhandle. At our practice, you will receive high-quality orthodontic care that is affordable. We will customize a financial plan that works for every family, including financing options. We use a slider method that allows our patients to choose a down payment and monthly payment that best fits their budget, and orthodontic insurance claims will be submitted on your behalf by our office. The costs for orthodontic treatment vary case by case, so the best way to receive an estimate is to schedule a consultation appointment at any one of our five locations. During this initial appointment, your orthodontist and his team will go over the estimated cost of your individualized treatment plan as well as your financial options and insurance coverage. More detailed information about this can be discovered on our Financial and Insurance Information page. Just like you, your treatment is one of a kind. While the average orthodontic treatment lasts less than two years, the best way to determine the length of your treatment is to schedule your complimentary consultation. Your journey with us begins with your consultation appointment, where you will have comprehensive 3D imaging done of your teeth. These images will be used to create a custom treatment plan for you that day. If treatment is recommended, then we can even place the chosen braces that same day. Can I return to work the day I receive braces? Most of our patients have no discomfort the day they receive their braces. If you do feel some minor soreness while adjusting to new braces, it will only last a day or two, and over-the-counter medication such as Advil or Tylenol will offer relief. What are routine orthodontic appointments like, and how often will I need to come in? Routine appointments generally involve an oral hygiene review and checking of your braces. You may receive new wires, or new methods will be started to further correct your teeth and bite. These appointments are usually short and last around 20–40 minutes. We like to schedule appointments about every six to eight weeks. If your treatment is more extensive, we may schedule appointments more often, but we will make every effort to ensure the appointments are as efficient and convenient for you as possible. We will work with you to arrange appointment times that fit with your schedule. Yes. All orthodontic patients must continue to maintain their oral health with regular visits to the family dentist every six months or so for a cleaning and exam. Keep up your excellent brushing and flossing habits as well—two times per day is recommended. Our team will demonstrate the best way to brush and floss once your braces are on because maintaining excellent oral hygiene while in orthodontic treatment is vital to the success of your treatment. At a minimum, you should brush after each meal and before going to bed. A daily floss is recommended as well. Once your treatment begins at our practice, you will be provided with toothbrushes, flossing aids, toothpaste, and mouth rinses to help you achieve that beautiful, healthy smile you’re dreaming of. Don’t worry, you can still enjoy a vast array of delicious foods while in braces, but once orthodontic treatment begins, there are a few foods to avoid because they can cause damage to or deform the brackets and wires of your braces. These include ice, hard candy, nuts, apples, raw vegetables, sticky foods, and gum. Most of the emergency appointments to repair broken or damaged braces are due to patients ignoring the instructions we will provide once you begin treatment—these instructions include detailed dietary guidelines. All orthodontists are dentists, but only about six percent of dentists are orthodontists; therefore, for the highest quality orthodontic treatment and results, it’s important to choose an orthodontist that is right for you and your family’s orthodontic care. Orthodontists are specialists in the diagnosis, prevention, and treatment of dental and facial irregularities and have extensive and specialized training. When seeking braces of any kind, your/your child’s orthodontic needs should be assessed by an orthodontist so that a professional, safe, and personalized treatment plan can be developed and carried out from start to finish. Mail-order aligners are a definite no-no! For real stories from our patients about receiving braces at our practice, check out the videos on the Patient Stories page.